Christmas Joy to you and yours…..
Merry Meet my wonderful readers! It is after 5pm Christmas eve. I am settled in by the fire with husband and daughter at my side. A Mickey Mouse Christmas is on tv, a glass of spiced wine is in my hand. My hubby is trying to secretly wrap the gifts he chose for me, my daughter is dozing, and I am feeling warm and happy and accomplished! 🙂 Wrapping is done, gifts are bought, the fridge is full and the candles and fire are lit. Tomorrow and the next day will be busy and festive and fun. On Sunday, my daughter, her hubby and my granddaughter will be here for our family gift exchange and a brunch. We started celebrating a different day when our beautiful granddaughter came along. So they could be home in the morning with her and her gifts from Father Christmas. Changing things up was necessary and a surprising positive thing. We are much more relaxed and less rushed and it’s always a peaceful, relaxing, fun day. As I said in a previous post, Christmas for us has always been a secular holiday..we do not celebrate the birth of Jesus Christ. But we don’t mind being told Merry Christmas either. We are open to all religions and their celebrations. 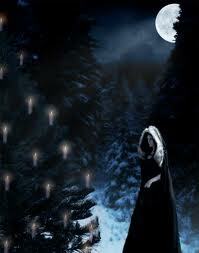 So be it Yule, Hannukah, Christmas, Kwanzaa…however you celebrate it, it is a magickal time of year. What would be really wonderful, is if everyone could keep the way they feel this time of the year, in their heart and minds all year long. The love that is shared with your family and friends, should be shared all year long. Feeling the thrill of christmas morn like a child, the warmth and comfort of a fire or a lit candle, the feeling you have when you see the faces of your children and grandchildren opening their gifts, the swelling heart you feel when your loved ones are gathered around the table, the smell of food cooking and the tree and greens that adorn your home, and the peacefulness of a dark room with lit tree and fire….all those feelings should be there all year long! Try to record these feelings in your memory and recall them all year long! I wish you all a joyous Yuletide season…However you celebrate it. May your next year find you and yours healthy, happy, prosperous, and content with the life you are living. I am appreciative of all of you who come here to visit, and to my sisters in spirit, and my facebook friends who have helped me grow so much in my path, my experience, and my lessons in life! I am most Goddess Blessed indeed. Love to my family who support and love me and whom I love more than life itself. I wish you were here too sweet Saffron! I love you too and am so blessed to have you as a sister of mine!! Happy christmas day!! I love it and I love you!! I’m so glad to have you as a sweet sister~May you and your family be wrapped in joy this season! Happy christmas to you and yours my sweet sister! I love you and am so blessed to have you in my life!! Happy Christmas time to you as well. Happy Christmas to you Sophiadawn! Thank you so much for subscribing and visiting my blog. Aww Diane…I feel the same way about you “big” sister! Did I tell you I always wanted a big sister..and now I have one..a wonderful loving one!! Happy Christmad to you and yours and give Zoey a hug from me! Happy Christmas to you and yours dear sister!! I have been so blessed from having you in my life! Love you much! You always word everything perfect!!! Very true if everyone was so open to all religions and celebrated love and joy during holiday season whatever holiday specifically it about love caring sharing and being thankful Perfect!!!!!!!!!!!! Thank you so much Kimmie! I love you. Happy christmas to you and yours. I’m so happy to have you as a sister!